And so she started her childcare since beginning of May. 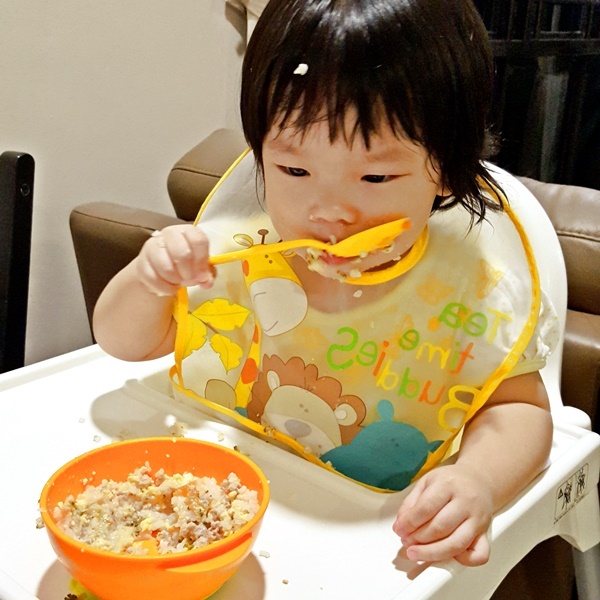 At the same time, since first day of school, she begins to prefer self-feeding rather than begin fed by us, although we are glad that she is learning to be independent, the outcome of letting her self-feed is rather disastrous. She developed separation anxiety and cries every morning when Kpo Kia Papa dropped her off to school, and =.=” whenever we picked her up in the evening. She also become more aware of her surroundings and strangers, and took even a while to warm out when we went to visit her grandparents. Even her hair also ended up with her dinner… OMG! She become so clingy to Kpo Kia Mama and Papa that sometimes we really have problem when we need to run errands without her as she will cry her lungs out whenever she realised she is ‘left alone’ with the elderly. On the last Monday of May, she suddenly overcome this separation anxiety, in the morning, she waved good bye to Kpo Kia Papa and walked into the class without looking back at him, in the evening, she run happily toward Kpo Kia Mama and keep turning back to wave good bye to teacher even after we left the class. Wow! she is progressing very fast and so cute. Thta's the cute stage of kids I would say, it's lieterally thier first exporsure to recognise words and listening! !